When looking at a collection, customers can easily select their preferred Size, Color or other options. Their choices are remembered when browsing different collections. Available options depend on each collection. Filters appear automatically only when products with those filter options exist in the current collection. For example, when looking at Shirts, one can choose Medium / Large sizes, but when browsing Shoes, the sizes are 6, 7, etc. When looking at Dresses, a search by Material might be available. There is no work required from you to keep automatic filters updated -- just continue to run your shop as you did so far, and let the app keep everything current. Optional, choose to show only products available in stock. Multiple selections for a single filter (e.g. Size Medium or Large) are not supported. Where do filter options come from? Automatic filters take data from your Products, if it's already specified in Shopify. You can manually tag products for additional filters. Customize what filters are available, and how to display them (select lists, checkboxes or active links), including translating or renaming each option. Style them exactly as you wish using CSS. Do you want customers to focus only on what's in stock now? Choose to Exclude out of stock variants, and the app will limit options only to what's available now. Styling changes not included. Your designer can help with further customization. How can I remove the cf-* tags created by the app? If you uninstalled the app, please re-install it temporarily. There's no need to start subscription. Go to app Settings, and instead of "Size,Color" etc, leave blank the first field. Save and then click Update product and collection tags. How does the app know when a product is out of stock? The app goes through all products periodically. If there's at least a Size Medium variant in stock (with any Color), the entire product will be tagged as cf-Size-Medium. If there's at least a Color Blue variant in stock (with any Size), the entire product will be tagged as cf-Color-Blue. In some cases, this might result in having products shown when selecting Medium Blue, although Medium Blue isn't in stock. Can we have different filters for different types of collection pages? 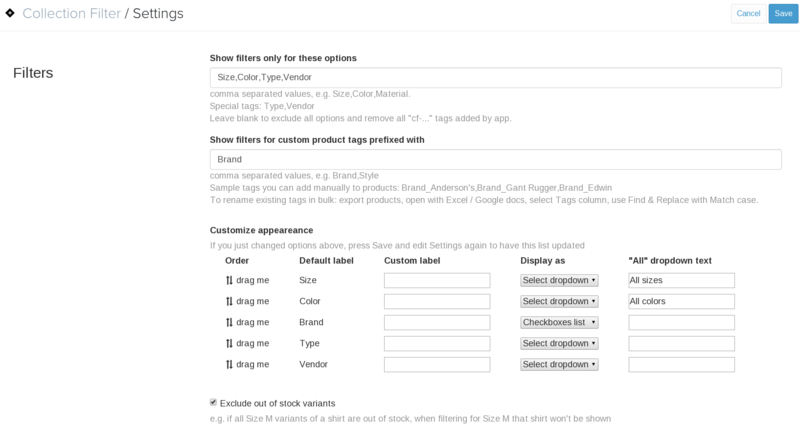 Filters are shown automatically with options available only for products in that collection. For example, if a collection doesn't have any products with Size option, then Size won't be shown when viewing that collection. Can the app filter by Price? 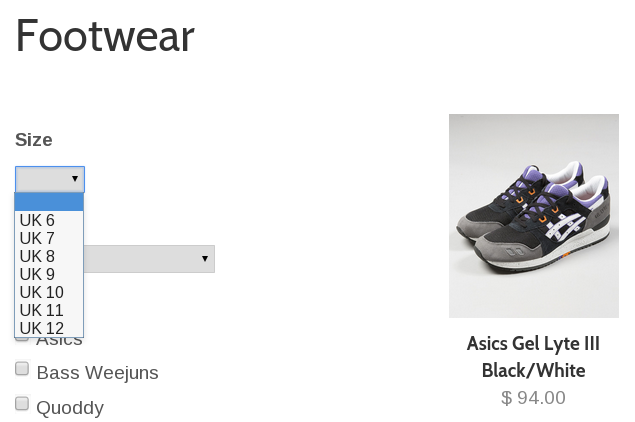 From our experience with building high-profile shops (Vera Wang, DOPE, TOMS), a better customer experience would be to have the ability to sort by prices ( example), instead of restricting results to a certain price range. Focus on finding a good fit first, and then look at the results sorted by price in case a customer is so price savy. We can add sorting as part of the setup for another $15 (one-time fee). If you'd really want to have a Price filter, the only solution would be to tag products manually, e.g. Price_Under $25, Price_$25 - $50, Price_$50 - $100, and then add "Price" in app Settings -> Manual filters. After selecting a filter, will the app adjust the other filters to show options valid only for existing selection? No. All filters applicable in collection will be shown. Can customers select multiple options for a single filter, e.g. multiple Colors? No, sorry. Only one option at a time works for one filter. Different simultanteous filters do work (e.g. Blue Medium Shirts). Other apps claiming to have multiple options for one filter work actually only for the first 50 products in a collection. Can I have filters on a left sidebar? Only if your theme has a built-in sidebar. It is quite complex to implement a sidebar. Note that it has to work great on mobile too, where the sidebar moves to the top. As an alternative, filters can be placed in the center as drop-downs, before the product listing.